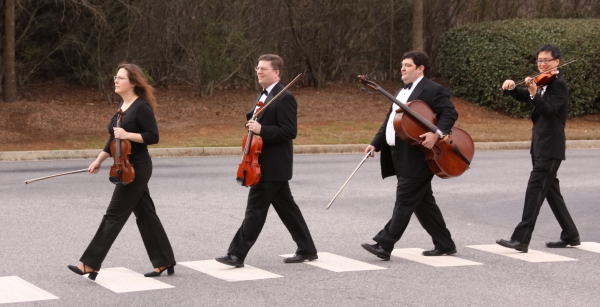 We've performed at more than 600 weddings – and made each one unique! From classical to classic rock, baroque to Broadway, we'll set the perfect tone. What music do you imagine at your wedding? Is it soft and flowing, bright and regal, fun and surprising? 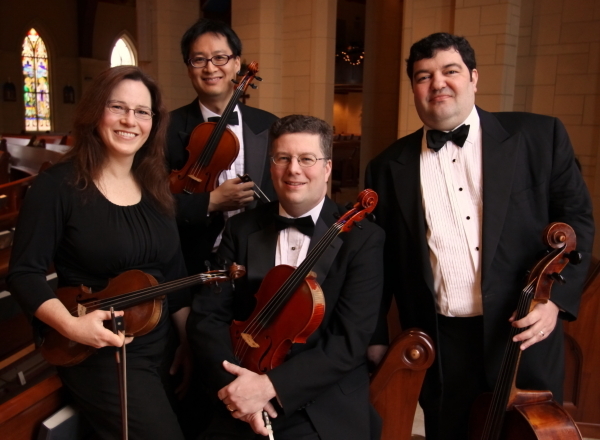 Since 1998, the After Five String Quartet has helped hundreds of couples express themselves with music that sets the perfect tone for their special day. We work hard to give couples exactly what they envision for their wedding ceremony, cocktail hour and/or reception — at an affordable price and high performance level. 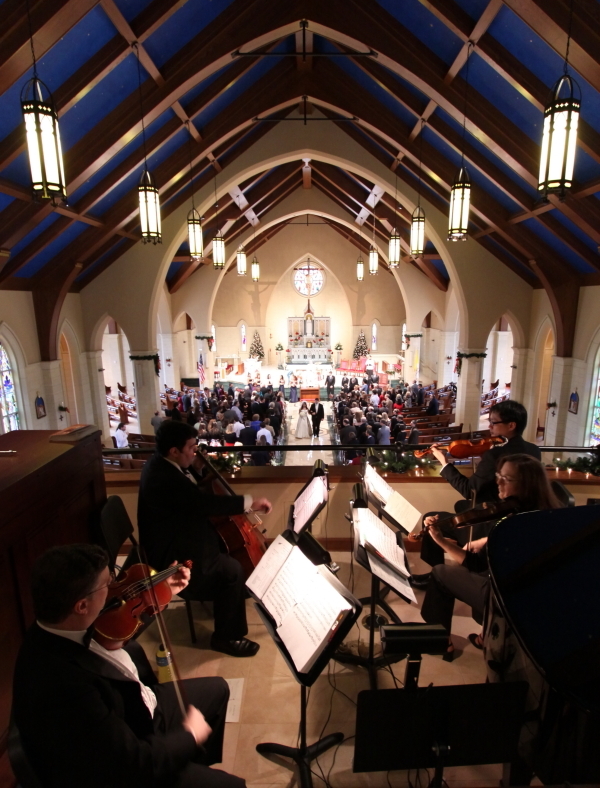 Our repertoire includes everything from traditional classical wedding pieces to contemporary songs. We accompany vocalists or other instrumentalists on request and also do our best to honor special music requests. Please visit our website to find out more about us, request a quote, and listen to music samples. Come visit us during a rehearsal for a free mini-concert! Amazing musicians! Loved the modern music they played for our ceremony and cocktail hour. Very easy to contact with fast response time! Highly recommended!! Wonderful music! Professional team and reasonably priced. Also, easy to work with; showed up on time and performed all my requested music. It was lovely for our "before and after" the ceremony. Wouldn't change a thing. We were beyond thrilled with this quartet. 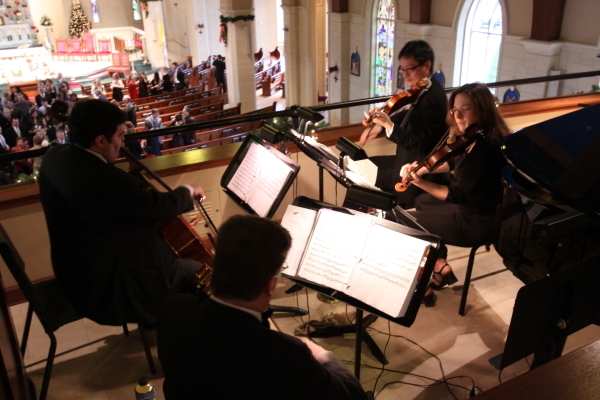 We had decided early in the planning process we wanted a 4-piece string quartet for my daughter's wedding mass and it was worth every penny. Because of Debra, my daughter got exactly what she wanted. Debra kept in constant communication with us. We needed to change a couple of our music selections and add a couple of music selections for our Catholic mass, Debra got back with me right away as well as making suggestions. Since the wedding was on the 15th of December, we requested traditional Christmas music for the prelude and it was lovely. I was very pleased that they had made contact with the vocalist regarding the "Ave Maria," and when the original vocalist became sick, they took care to work with the vocalist who replaced her. I am the Mama of the bride, but I would say, that my favorite part of the wedding was the mass and "After Five Quartet" was a huge reason why, the music was outstanding the guests thought so too. 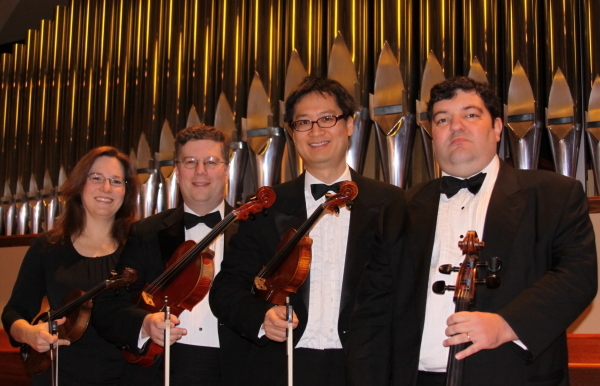 I am very happy I chose After Five String Quartet for my daughter's wedding. They were so good that some of the guest actually thought they were hearing "piped" music until they looked up in the bacony and saw the quartet playing! They are first class. I would highly recommend them. I began working with Deborah ten months in advance. She was kind, professional and prompt in all her correspondence with me. She helped me pick music for a special tribute to our family that could not attend and learned a solo of a special song. They were FANTASTIC!!! We had a fabulous experience start to finish with After Five String Quartet, and will definitely look for opportunities to use the group again. We were unsure of the music to use at our wedding, and AFSQ invited us to a rehearsal and play a variety of songs for us to choose from. It was just what we needed. It was important to us that the musicians we chose be impeccably professional at the wedding ceremony, and AFSQ more than achieved this. From showing up early to discreetly setting up and breaking down, the group was perfect. And the music? Simply splendid. Our daughter's wedding was held at the Ritz-Carlton Atlanta, GA. The After Five Quartet provide the ceremony and cocktail reception music. They certainly added another touch of class to an already spectacular event. They are extremely professional and talented. We definitely would recommend and will be utilizing their service for future family special occasion that are held in the greater Atlanta area. The music was amazing. Deborah and I hand selected the playlist, which was prefect for our wedding, refined elegance. After 5 was the only vendor we used who kept to our timeline. Deborah set expectations, and followed through when she said she would. I'm forever grateful. From start to finished they impressed me and our guests. I would highly recommend them for your next event. Words cannot express how happy we are to have gotten the opportunity to work with the After Five String Quartet! From the very first communication to the last, they were incredibly personable yet professional and just a truly gifted group of musicians! At our very first meeting, they offered suggestions that fit our tastes perfectly and obviously knew their song selections like they knew their name... and they have well over 200 selections! They dressed professionally for the ceremony, played beautifully, and all made sure to congratulate us as they were leaving. They are the perfect balance of professional yet personal and amazing talent for an incredibly reasonable price. I cannot recommend them enough! Thank you, After Five String Quartet! I absolutely LOVED working with After Five! They are all such great people and talented musicians. The price was great, especially for the value added to our special day. They customized our song list and even had my husband and I over to their practices twice to help us think of our song list! They made us feel like we were their only clients and I am certain we booked them during one of their busiest times of year! I had the pleasure of working with Deborah with After Five Quartet for my wedding in February at the Biltmore Ballrooms. She was absolutely amazing - so responsive and such a pleasure to work with. When it came to the "big day", After Five Quartet set such a wonderful ambience with their music, the guests really enjoyed it. All members were prompt and professional and are just all really, really talented individuals. I highly recommend working with this group - especially for such a big and important occassion like a wedding day! HIGHLY RECOMMENDED!! Deborah and her group were so professional and so easy to work with. They listened to us on every level and what type of music Heather and Shawn wanted. They made some wonderful suggestions when to play the actual pieces and even learned the UGA fight song for the recessional. Our guests made many compliments on the string quartet and the selections they played during the wedding and cocktail hour. They stayed in contact with us during the whole process and even gave us a CD of the songs we chose to use at our rehearsal. I would highly recommend this wonderful group and appreciate all they did to make the wedding a complete success. I am the Mother of the Bride. Working with After Five was a pleasure. They are talented musicians and very accomodating. They learned a song for our ceremony (from piano music) and performed it perfectly. Using this vendor was totally stress-free. I highly recommend them. After Five was amazing to work with! There were a couple songs that I really wanted to be played at my wedding that they did not offer (which was suprising because they offer everthing under the moon). They found the music and learned how to play the songs in a short time and performed them beautifully at the wedding! Everything was perfect! I would definitely definitely use them again and definitely definitely recommend them! Thank you After Five! I would recommend After five quartet to anyone whose in need of wonderful music. From the initial meeting that we had with her, we felt very comfortable with her and the rest of the group. She responded every questions that I had via email very promptly. She didn't mind meeting us and discussing every detail and was very friendly yet professional. She helped us in music selections and everything turned out so wonderfully. Everyone complemented the music for our ceremony. Thank you Afterfive for making our ceremony so special! We were very pleased with After Five String Quartet. Deborah was so easy to work with from the start. She met with us to help us make our selections, and she was very knowledgeable and had excellent suggestions. After Five has an extensive variety of music from which to choose. On our wedding day, they were absolutely perfect - the guests loved them, and we would not hesitate to hire them again for another event. We can not tell you enough what a joy this group is to work with! Deborah worked very hard at finding all the music we were looking for since we were not looking for your average classical pieces for our ceremony and she was always very quick to respond to any questions we had. It was so nice having such an easy person to work with. The ceremony music was wonderful. They all played beautifully! If you are looking for a group that plays classic rock, this would be the group to go with! Everyone loved them and were so surprised when they actually recognized every song they heard. 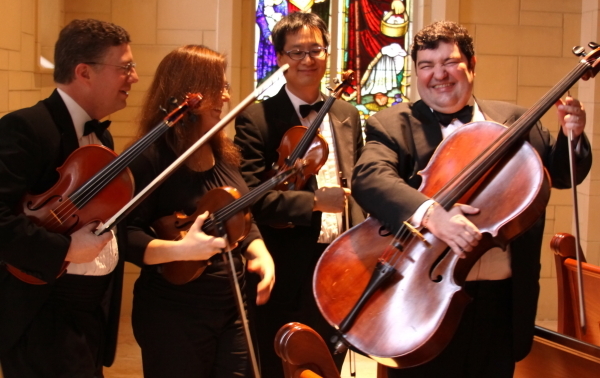 We would definitely recommend this quartet to anyone who wants a string quartet played at their wedding. The quartet did an amazing job. They played all the songs I requested. I would greatly recommend them to other brides, as I already have. Deborah was great at recommending what songs to play at the appropriate time throughout the ceremony. I also like the variety of music they play; everything from classics to todays hit music. I would certainly use them again if an opportunity arises. After Five String Quartet was amazing to work with. They took the time to work on a special song for me and made sure it turned out perfect. They were professional, kind, reassuring, and quick in their responses to me. I never felt like I had to worry about my ceremony music. Any bride who is planning a wedding would be lucky to have them and would never need to stress about the quality of music for her big day!